Not sixty seconds into Beautiful Friction and it is clear; the haunting guitar of Jamie West-Oram, expressive synth of Rupert Greenall, pounding bass of Dan K. Brown, steady beat of Adam Woods and unforgettable vocals of Cy Curnin add up to the undeniable sound that could only be The Fixx. Apart, you couldn’t refute their talent, yet it’s together that they shine. Together, The Fixx has an incredibly strong voice, strong legacy and strong future. The songs recorded for Beautiful Friction are a high point in the band’s already heralded history. Echoing the frustration and pain of the “99%”, the first single “Anyone Else” is an anthem for our times, with a soaring melody that allows the song to feel melancholy and hope all at once. Optimism grows further with the wistful “Just Before Dawn,” the album’s second track which speaks of hope after the darkness. “What God,” a philosophical tour de force, features a passionate vocal wail of confusion, doubt and self-revelation by Cy, backed by the band’s driving musical crescendo. The frenzied wired pace of “Follow that Cab” delivers a lyrical metaphor, with the cab as an allegory for a life out of control. The optimistic “Shaman” could be the long lost musical sibling to “One Thing Leads to Another” while the title track highlights a unique vocal coupled with a sensual groove and evocative keyboard. “Girl with No Ceiling” captures the present, wise and introspective band meditating on the fleeting reality of fame and fortune over a subtle beat. 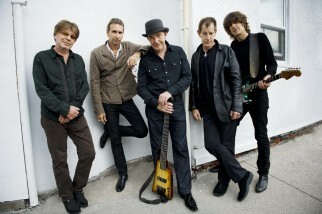 The Fixx, never a band to rest on its laurels, is still searching, still asking questions and still seeking truth.